Andre is a member of the Rotary Club of Kuching Central since its charter in 1986 and was the past president of the club in 1995-1996. Over the years, he has been a very active Rotarian and held many different portfolios in Rotary at the club and district level. He was appointed as the Assistant Governor for Group 10 (Kuching) for the Rotary year 2002-2003 under the governorship of the late PDG Michael Graham Parry. His first appointment at District level started in 1998 as a District Webmaster & District Award Chairman under the then District Governor Datuk Stephen Timothy Wan Ullok. Since then, his active involvement at District level became an annual affair including the appointment of a District 3310 Trainer in 2008-2009 for the then District Governor Edward Burongoh, a post normally held by a Past District Governor. Andre has held various posts at club level since the club’s charter. He was instrumental in getting the club to adopt Avoidable Blindness initiatives as one of the club’s signature projects especially in eyes screenings and cataract operations. He project managed the first eye screening project in the rural area of Kapit in Sarawak for 650 people. He was also active in successfully getting the support from CIMB to finance the cataracts operations for the low income group. 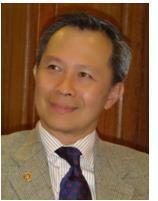 He was born in Jakarta but studied in Singapore since primary 5 until the completion of his secondary education. He subsequently left for England to do his ‘A’ level and continued with his tertiary education there. He holds a Bachelor of Science in Computing Science from Essex University and a Post Graduate Diploma in Accounting and Finance from the London School of Economics (LSE), University of London. It was during his college days that he met Sarawakian Norzan Bujang, who is now his wife since 1984. They have 2 daughters and a son. But on the 3rd August 1998, the eldest child, Karina, passed away. The second child, Atika, is now back from Perth as a Certified Public Accountant working as Assistant Manager for Group Finance in a public listed company in Kuala Lumpur while son Irwan is still pursuing his 3rd year in Bachelor in Quantity Survey at Taylor’s University in Kuala Lumpur. While Andre & his family still visit Jakarta regularly to see his mother and sisters, home is based in Kuching, Sarawak, East Malaysia. On the business part, there are three key areas that he spends most of his working time: as CEO of an IT company whose key businesses are in systems integration & consulting services for world class SAP integrated business software and in the automotive business which imports reconditioned cars as well as sales & servicing of Toyota vehicles in Kuching. The third area is in his recently setup business in the processing of rubber wood for exports to China. Andre is also currently founder & chairman of The Malaysian Computer & Multimedia Industry Association or PIKOM in short, for Sarawak Chapter. He and Norzan are passionate golfers although Norzan is a better golfer.